Happy Friday the 13th! In celebration of this infamous and terror-inducing date (and with all due respect to that other masked fellow associated with today), Anchor Bay Entertainment and Scream Factory proudly unveil the official art for the September 23rd release of the Halloween The Complete Collection Blu-ray. Please see artwork below of the 15-disc Deluxe Edition and the 10-disc set. Stay tuned for more details, including updates on the bonus features and photos taken from behind the scenes! For the legions of Halloween fans, the Deluxe Edition boasts 15 discs and contains all the Halloween feature films - Halloween, Halloween II, Halloween III: Season of the Witch, Halloween 4: The Return of Michael Myers, Halloween 5: The Revenge of Michael Myers, Halloween: The Curse of Michael Myers, Halloween: H20, Halloween: Resurrection, Rob Zombie's Halloween and Halloween II. 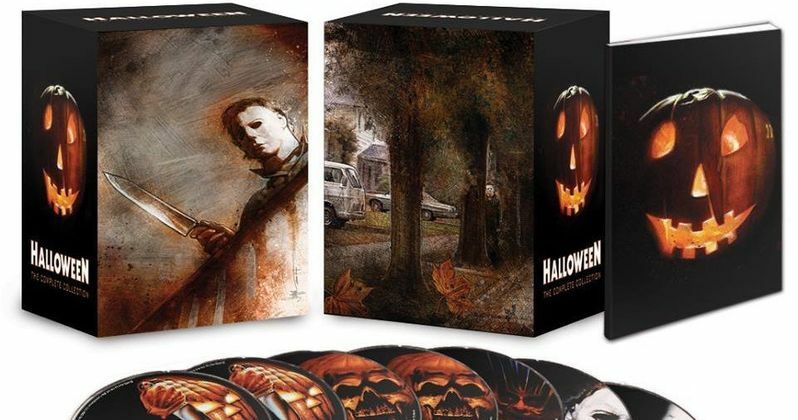 The set includes the never before released producers cut of Halloween: The Curse of Michael Myers as well as the ultra-rare network TV version of the original Halloween, the network TV version of Halloween II, plus the unrated versions of Rob Zombie's Halloween and Halloween II. It is packed with hours of brand new bonus features including new interviews with cast and crew from the entire franchise! In response to years of fan feedback, the first Halloween will now also include the original mono audio track and the set will include both versions of the original Halloween - the original Blu-ray release and the recently remastered 35th Anniversary version with the mono track added back in! It also comes with a limited edition 40-page book written by Michael Gingold of Fangoria Magazine. The collectible packaging will include a newly commissioned illustration on the outer case and each film will be in its own black Blu-ray case with the original theatrical one sheet as the key art. This deluxe set carries an SRP of $169.99. The original indie blockbuster that launched a thousand cuts... Halloween stars Jamie Lee Curtis (A Fish Called Wanda, True Lies) in her debut role. Anyone who's ever watched a horror film in the last 35 years knows the story of Michael Myers, who as a child, butchered his sister with a kitchen knife. Committed to a mental institution and watched over by Dr. Loomis (Donald Pleasence, Halloween II, Halloween 4: The Return of Michael Myers, Halloween 5: The Revenge of Michael Myers, Fantastic Voyage), he engineers his escape 15 years later, returning to his hometown of Haddonfield, Illinois on Halloween night to terrorize anyone who gets in his way, including babysitter Laurie Strode (Curtis). Co-starring P.J. Soles (Carrie, Stripes, Rock 'n' Roll High School), Kyle Richards (The Watcher in the Woods, Eaten Alive), Nancy Kyes (Carpenter's Assault on Precinct 13, The Fog), Charles Cyphers (Escape From New York, The Fog) and Brian Andrews (The Great Santini, Three O'Clock High), Halloween also cemented the careers of many behind the camera including Carpenter, Dean Cundey, producer Debra Hill and film editor/production designer Tommy Lee Wallace (Halloween III: Season of the Witch). Picking up exactly where the first film left off, Halloween II follows the same ill-fated characters as they once again encounter the knife-wielding maniac they thought they had left for dead. It seems the inhuman Michael Myers is still very much alive and out for more revenge as he stalks the deserted halls of the Haddonfield Memorial Hospital. As he gets closer to his main target, Dr. Loomis (Donald Pleasence) discovers the chilling mystery behind the crazed psychopath's actions. Written by John Carpenter and Debra Hill, Halloween II is a spine-tingling dark ride into the scariest night of the year. Airing on network TV since the early 80's, the TV cut features several new scenes and additional cut scenes as well as an alternate ending from the theatrical version. When a terrified toy salesman is mysteriously attacked and brought to the hospital, babbling and clutching the year's most popular Halloween costume - an eerie pumpkin mask - Dr. Daniel Challis (Tom Atkins, The Fog, Night Of The Creeps) is thrust into a terrifying Halloween nightmare. Working with the salesman's daughter, Ellie (Stacey Nelkin), Daniel traces the mask to the Silver Shamrock Novelties company and its founder, Conal Cochran (Dan O'Herlihy, Robocop). Ellie and Daniel uncover Cochran's shocking Halloween plan and must stop him before trick-or-treaters across the country are kept from ever coming home in this terrifying thriller from writer/director Tommy Lee Wallace (Stephen King's It). A decade ago, he butchered 16 people trying to get to his sister. He was shot and incinerated, but still the entity that Dr. Sam Loomis (the legendary Donald Pleasence) calls "Evil on two legs" would not die. Tonight, Michael Myers has come home again...to kill! This time, Michael returns to Haddonfield for Jamie Lloyd (Scream Queen Danielle Harris of Halloween 5 and Hatchet II and Hatchet III) - the orphaned daughter of Laurie Strode - and her babysitter Rachel (Ellie Cornell of Halloween 5 and House Of The Dead). Can Loomis stop Michael before the unholy slaughter reaches his innocent young niece? Michael Pataki, Sasha Jenson and Kathleen Kinmont co-star in this smash sequel that marked the long-awaited return to the original storyline and remains infamous for its startling twist ending and graphic violence. Because Hell would not have him, Michael Myers survived the mine explosion thought to have killed him. One year later, his traumatized young niece Jamie (Danielle Harris of Halloween 4) is horrified to discover she has a telepathic bond with her evil Uncle...and that Uncle Michael is on his way back to Haddonfield. But Dr. Loomis (the late, great Donald Pleasence) has a new plan to destroy The Boogey Man in his childhood home using Jamie as bait. Tonight, the carnage begins again: Michael Myers is back with a vengeance! Ellie Cornell and Beau Starr return for this hit sequel that features grisly gore by Greg Nicotero (The Walking Dead). In a single horrifying night, Michael Myers' masked reign of terror changed Halloween forever! Now, six years after he was presumed dead in a fire, Myers has returned to kill again - and this time there's no escape! As the homicidal fury builds to a spine-tingling climax, the long-hidden secrets of the screen's most maniacal murderer are revealed...with shocking results! Starring a thrilling cast including legendary Donald Pleasence (Halloween) and Paul Rudd (Anchorman: The Legend of Ron Burgundy). The so-called "Producer's Cut of Halloween: The Curse of Michael Myers (aka Halloween 666), was a workprint of the original film. This smart and suspenseful thriller scares up a bone-chilling good time with original scream queen Jamie Lee Curtis (True Lies, Halloween & Halloween II) and a hot cast of hip young stars! Now the headmistress of a private school, Laurie Strode (Curtis) is still struggling with the horrifying, 20-year-old memories of the maniacal killer Michael Myers...when he suddenly reappears with a vengeance! And this Halloween, his terror will strike a whole new generation! Laurie's rebellious son (Josh Hartnett - The Faculty, 30 Days of Night), his girlfriend (Golden Globe Winner Michelle Williams- My Week with Marilyn), and the school security guard (LL Cool J - CBS's NCIS: Los Angeles) will become Michael's newest victims unless Laurie can conquer her greatest fears and put evil in its place once and for all! The time has come again for you to experience the frightening fun of Halloween - the motion picture series that totally redefined terror. Original Halloween & Halloween II alums Jamie Lee Curtis (You Again) and director Rick Rosenthal are back and joined by Busta Rhymes and Tyra Banks in the terrifying Halloween: Resurrection, another installment in the electrifying horror film series. The reality programmers at DangerTainment (Rhymes, Banks) have selected Rudy (Sean Patrick Thomas, The Fountain), Bill (Thomas Ian Nicholas, American Pie), Jen ("Battlestar Galactica's Katee Sackhoff) and a group of thrill-seeking teenagers to spend one fun-filled night in the childhood home of serial killer Michael Meyers. But the planned live broadcast turns deadly when their evening of excitement becomes a night of horror as Michael himself decides to crash the party. What happens when one legendary horror filmmaker tackles a horror film icon? A new chapter in the legend is born! Rob Zombie (The Lords of Salem, The Devil's Rejects) reinvents the ultimate slasher classic, unleashing Michael Myers for a bloody rollercoaster of a rampage like fans have never seen. Including a retelling of the original story that unfolds at a breakneck pace, as well as a chilling new introduction that finally reveals the secrets behind Myers' disturbing childhood, Halloween breathes new life into one of film history's most terrifying tales. Presenting both the original theatrical version and the unrated feature with director's commentary, thrilling bonus features including deleted scenes and an alternate ending, and an exhaustive 4 1/2 hour documentary giving a behind the scenes look at how Zombie created "the scariest Halloween to date" (Debbie Rochon, Fangoria Radio). Rob Zombie's H2 (Halloween) picks up at the exact moment that 2007's box-office smash, Halloween stopped and follows the aftermath of Michael Myers's (Tyler Mane) murderous rampage through the eyes of heroine Laurie Strode (Scout Taylor-Compton). Evil has a new destiny. Michael Myers is back in this terrifying sequel to Rob Zombie's visionary re-imagining of Halloween which grossed almost $80 million worldwide. It is that time of year again, and Michael Myers has returned home to sleepy Haddonfield, Illinois to take care of some unfinished family business. Unleashing a trail of terror that only horror master Zombie can, Myers will stop at nothing to bring closure to the secrets of his twisted past. But the town's got an unlikely new hero, if they can only stay alive long enough to stop the unstoppable.